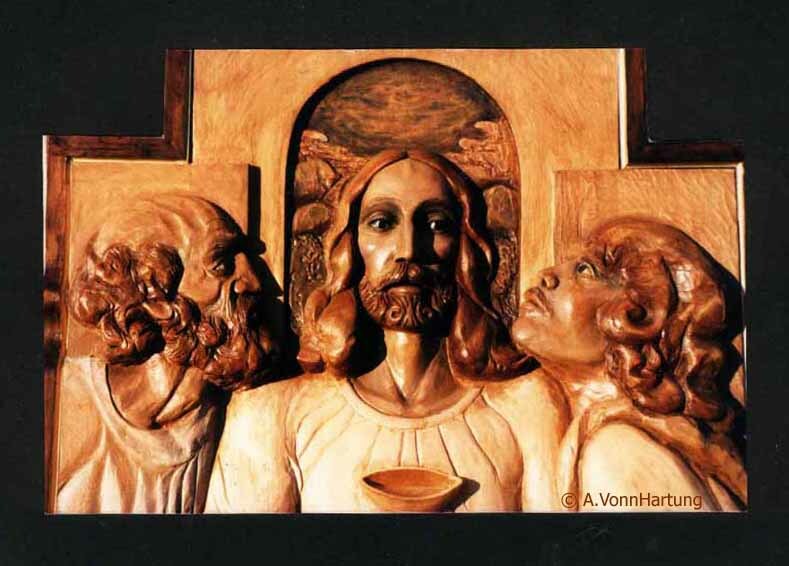 The reason for the use of Sacred Art in the Church is to make visible what is invisible, to bring us to a more heightened state of awareness and connection with God and His Saints that we might share more fully in His Glory and Love for us, that we might go forth and DO HIS WILL. Sacred Places of Jesus’ Life, Death and Resurrection have always been venerated – early pilgrims retraced the Way of the Cross. So it was that the pilgrims brought back from The Holy Land the idea of recreating those sacred places and events to share with the faithful of their home churches. It is said that Saint Francis of Assisi began the practice of the Stations of the Cross. It then spread throughout Italy and Europe. It was his practice to reproduce in a realistic way the events of our Lord’s life and deeds (an example, is his reported installation of the stable and manger with live animals and people in commemoration of the birth of Jesus). In a similar way I conceived these Stations of the Cross to bring immediacy to the Passion of our Lord. Each one measures 4-ft x 8-ft. This is because of the cavernous size and interior simplicity of the nave of the church, Santa Rosa de Lima, in the town of Guaynabo, Puerto Rico. Intimacy was achieved by the use of local people as models and customs so that the faithful might better identify with the trials that Our Lord and Savior suffered and died for because of His Love for us. Here we see Jesus, centered, surrounded by many but COMPLETELY alone, only those admitted from the status quo on both sides (although we see Flavia, wife of Pilate and perhaps Nicodemus who represent a small group of inside sympathizers). In the midst of a crowded room He is a lonely figure. All signs point to Him, the columns, the center aisle and all who gesture, single Him out in accusation. He is The One! The cause of all their troubles, indignation and hatred! He must DIE! 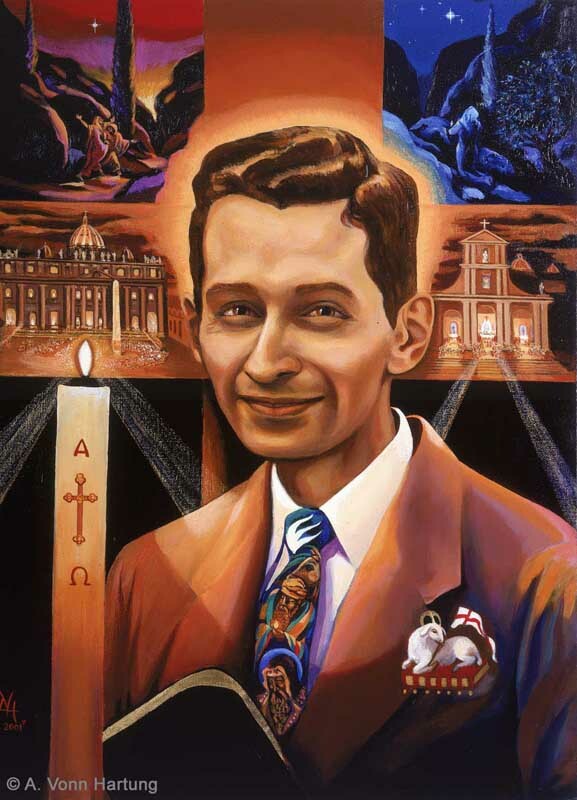 EWTN (Eternal Word Television Network) will be airing an interview on March 5, 2015 with A.Vonn Hartung about Blessed Carlos Manuel Rodríguez Santiago, and Vonn’s experience painting the portrait that is at the Vatican. The first 15 minutes of the program is a conversion story about a young man who turned his life around and is now studying for the priesthood; the second part is the interview with Vonn. Please visit the EWTN website for channel listings in your local area. This is the oil portrait of Blessed Carlos Manuel Rodriguez Santiago by A.Vonn Hartung © 2001, presented to the Pontifical North American College at the Vatican on the occasion of the beatification of Carlos Manuel on 29 april 2001, and is on permanent display there in the Hall of Saints.